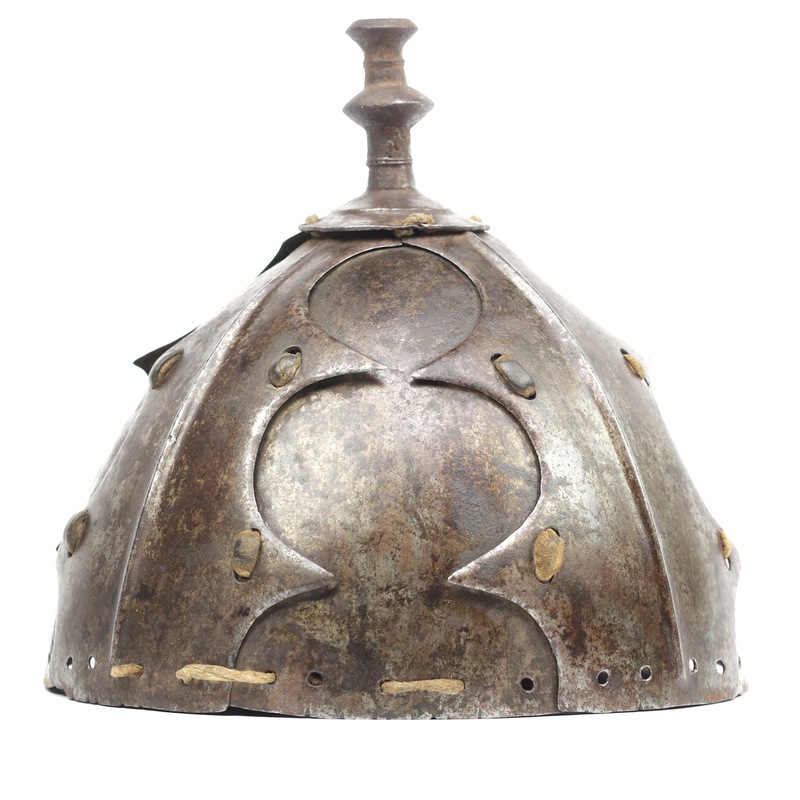 Presented in this article is a Tibetan eight-plate helmet with four inner plates joined by four outer plates. The plates seem to be made of forge folded steel, some laminations are visible at the edges. The four outer plates have raised ribs for extra rigidity. 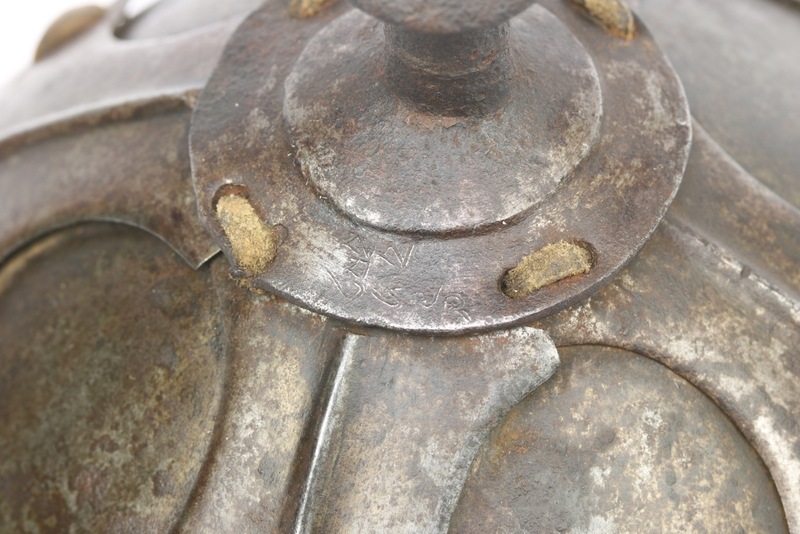 Note that these ribs are not embossed, they are an actual thickening in the forged plate. 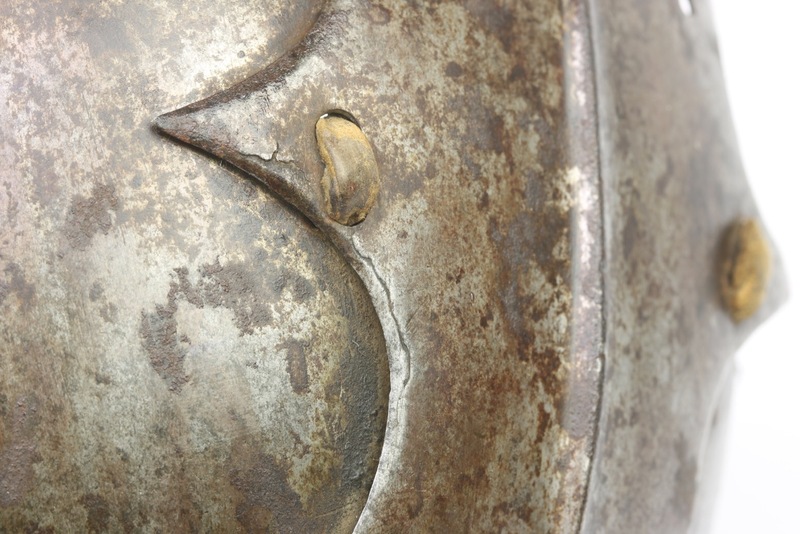 The outer plates have cusped edges forming two sharp points extending at either side, partially overlapping the inner plates. All is held together with leather straps, most of them seem to be very old and original to the piece. 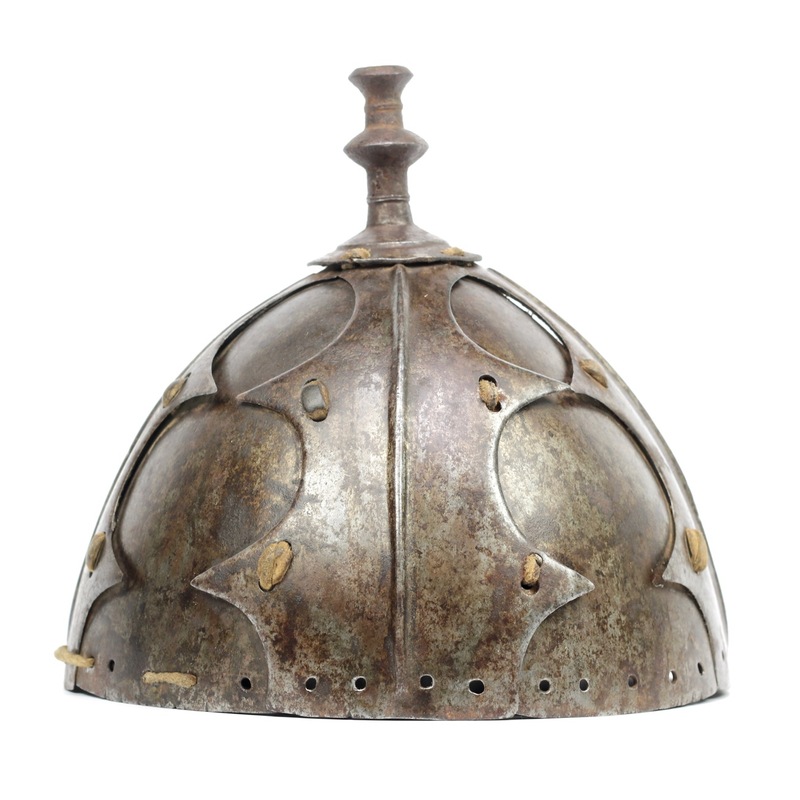 The helmet carries an inscription chiseled at the base of the finial. 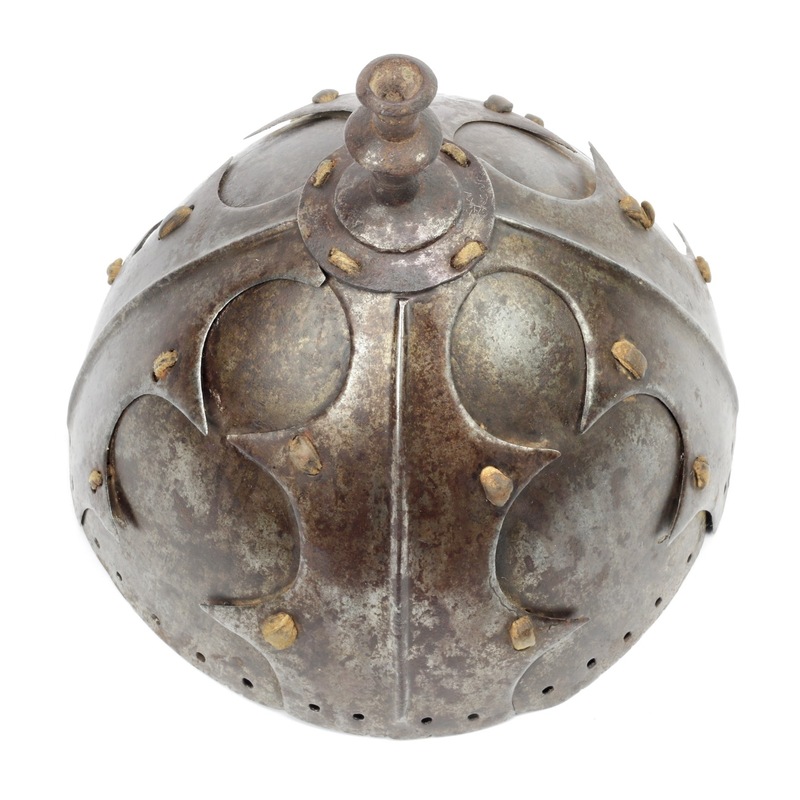 Similar helmets, and varieties of the type, are present in various museum collections. 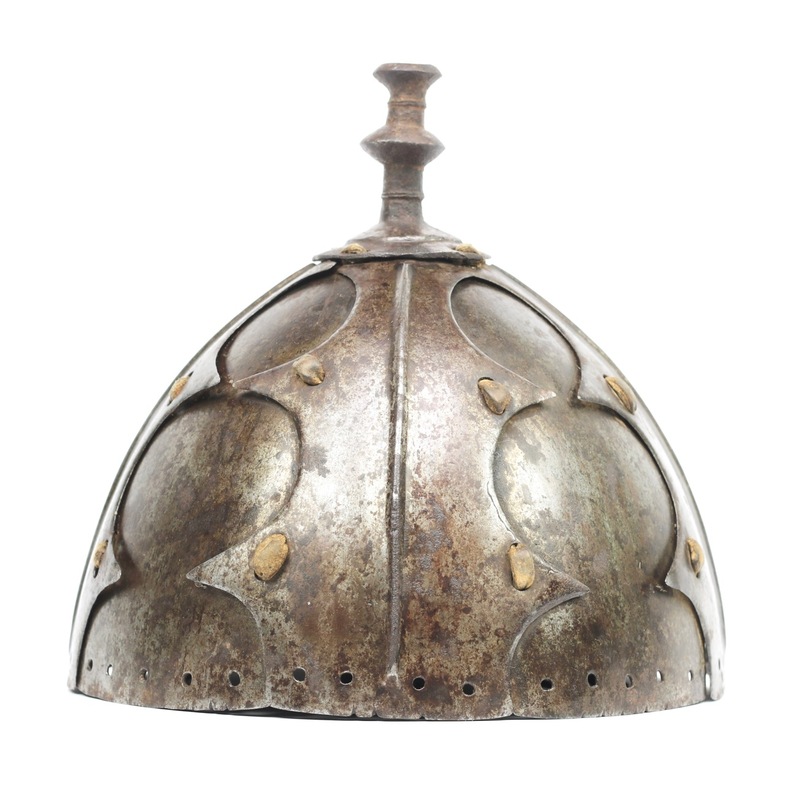 The best survey of Tibetan helmets is published in Donald Larocca's "Warrior of the Himalayas", which lists a fair number of similar helmets from the Met's own collection and various other museum collections.3 These often come with lamellar neck guards, giving rise to the idea that the piece of lamellar armor accompanying ours is perhaps a detached neck guard. 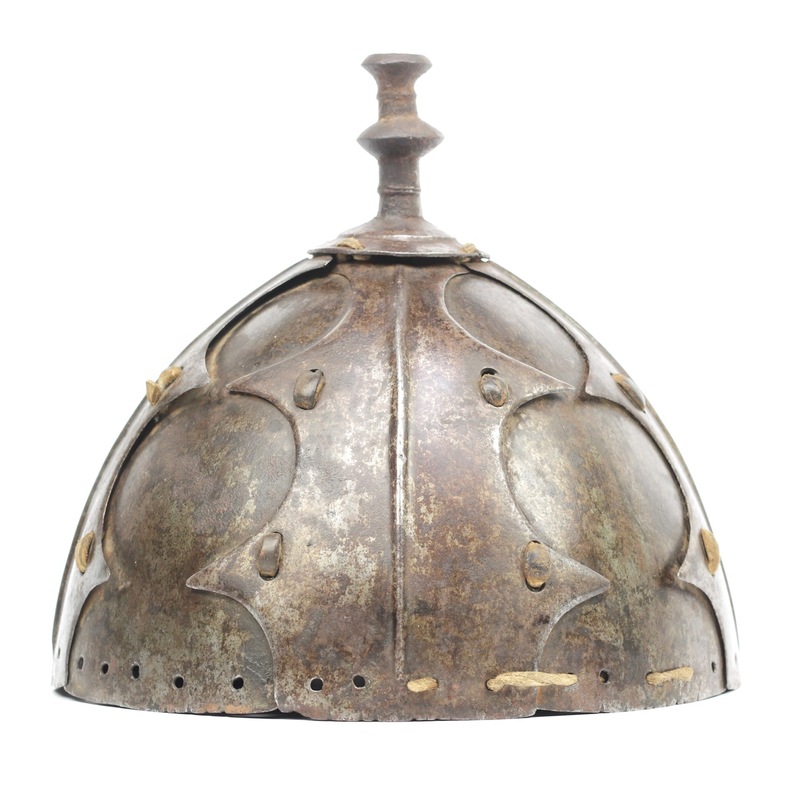 For pieces in the Metropolitan Museum's permanent collection, see accession numbers 2002.226, (riveted, with copper, early), 36.25.86, (riveted, no plume holder), 2008.354, (strapped, outer plates profile less sharp), 2017.160, (strapped, 16 plate design with yak hair brim), 1998.1, (covered with lacquered leather). 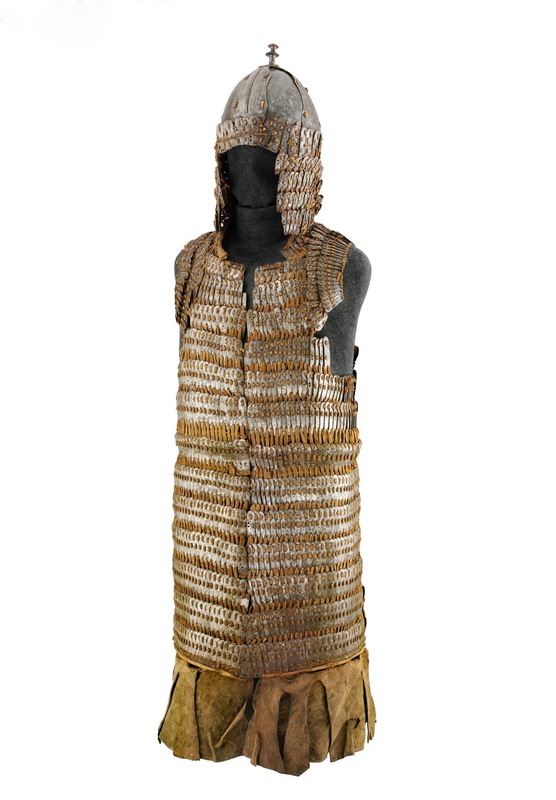 The Metropolitan Museum also possesses a full suit of armor, accession number 36.25.53a, b, consisting of a helmet with lamellar neck guard and a sleeveless skirt of armor. 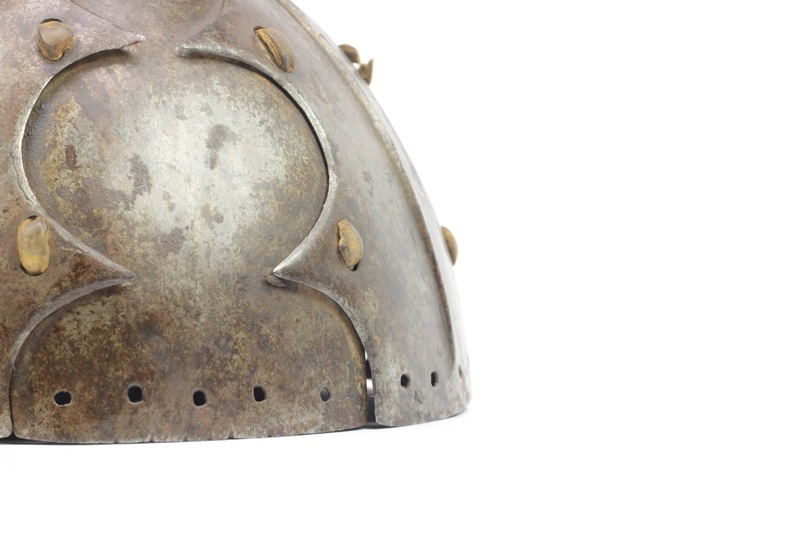 The helmet is of the same general type as the one presented in this article, but ours is more strongly cusped with sharp elements while the Met's example is less outspoken in shape. 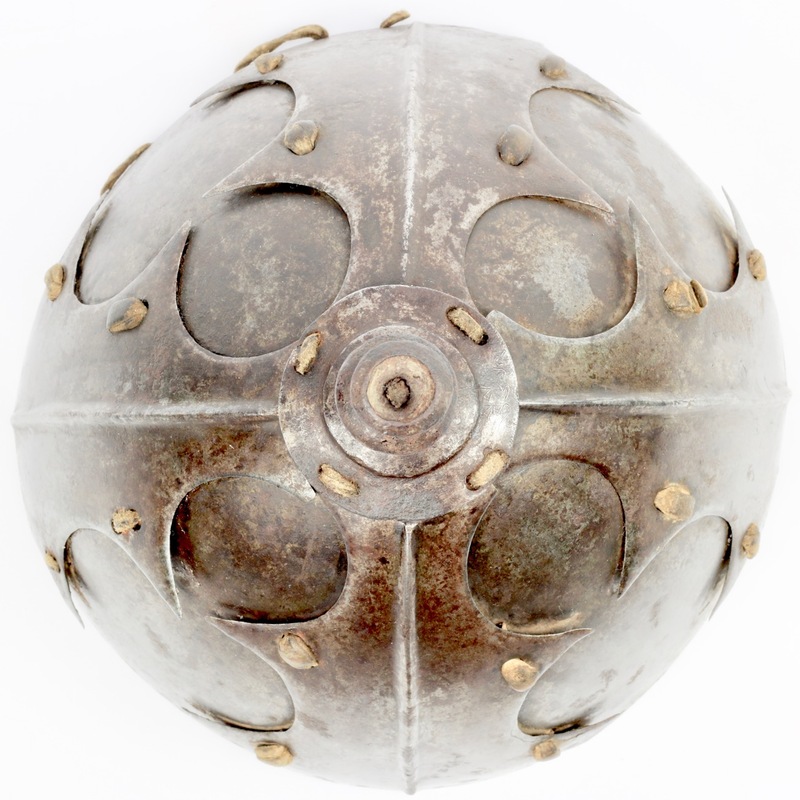 The lamellar associated to the Metropolitan Museum's example looks to be largely similar to the small piece of lamellar that comes with out helmet, suggesting they are indeed a match that originate from the same place and period. Metropolitan Museum accession number 36.25.53a, b.
Tibetan armor is very hard to date. One should always be careful trying to date items based on their condition, because condition is often more indicative of storage conditions than actual age. The dry and oxygen deprived Tibetan climate is excellent for preservation of metal and leather and pieces kept in local armories are often very well preserved. 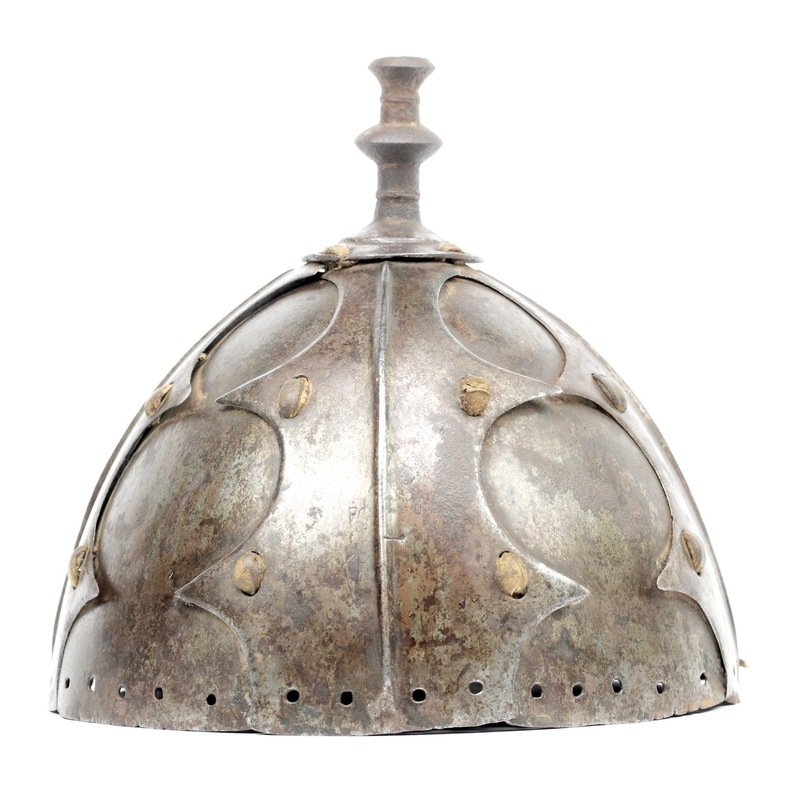 At present there is not enough information to establish a reliable stylistic timeline of the evolution of these helmets. 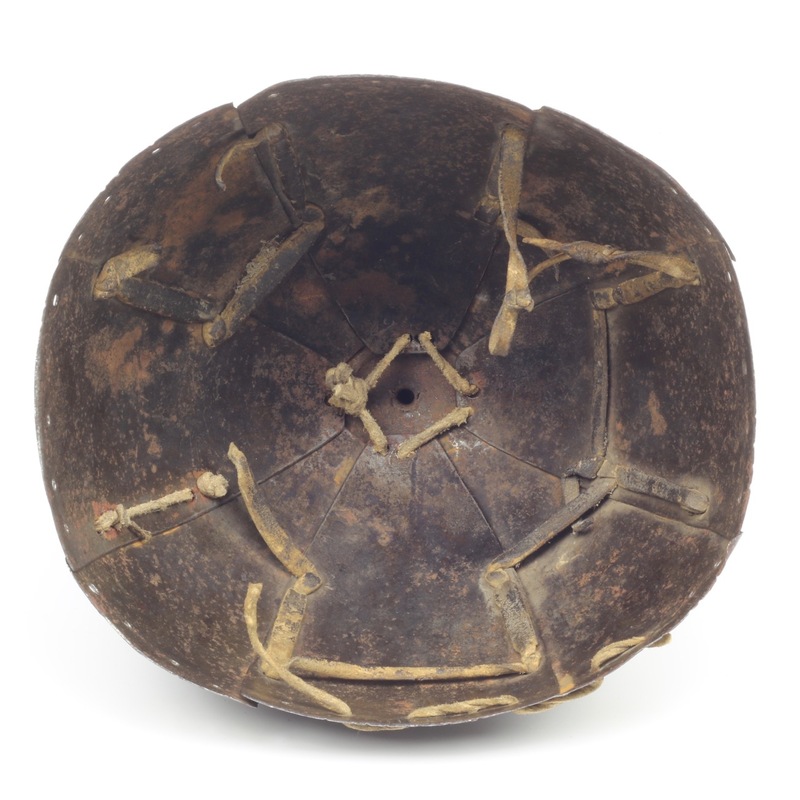 The sharply pointed cusped edges of the outer plates may be a hint, but it could just as well have been a local fashion that existed alongside the less extreme shapes. The leather lacing of a lamellar armor in the Metropolitan Museum was carbon dated to 1480 - 1660 with 95% reliability, indicating just how old some of these pieces can be. 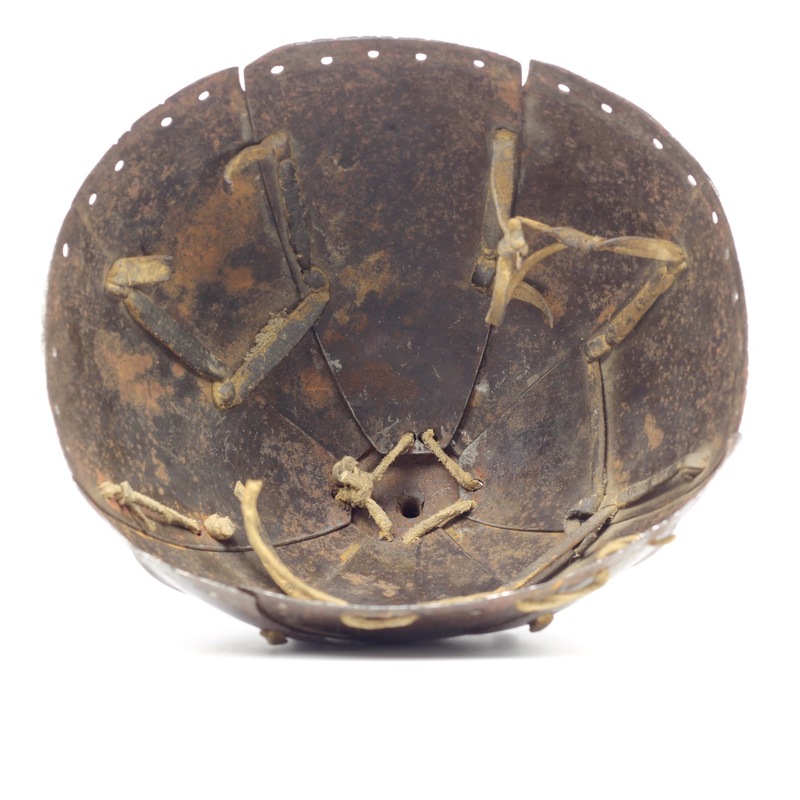 It would be interesting to carbon date some of the leather found in these two objects. 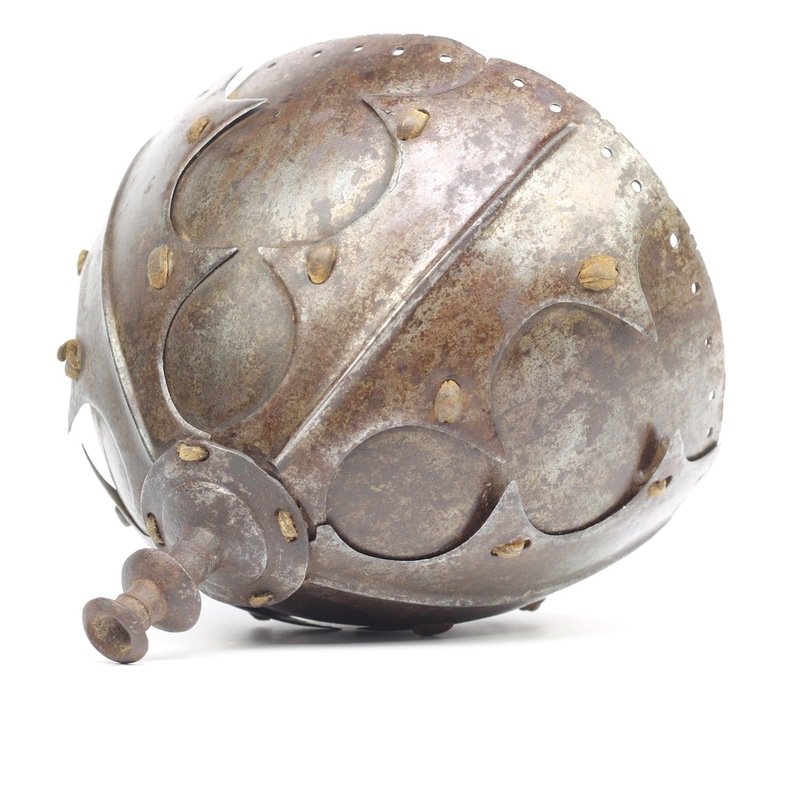 Until then, I think a tentative 16th to 17th century dating for these pieces is not unreasonable. 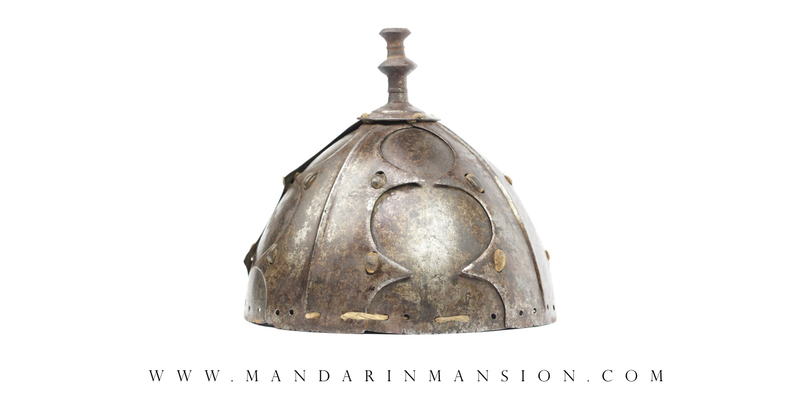 A Tibetan helmet with more dramatically shaped outer plates than usual, giving it a striking presence. 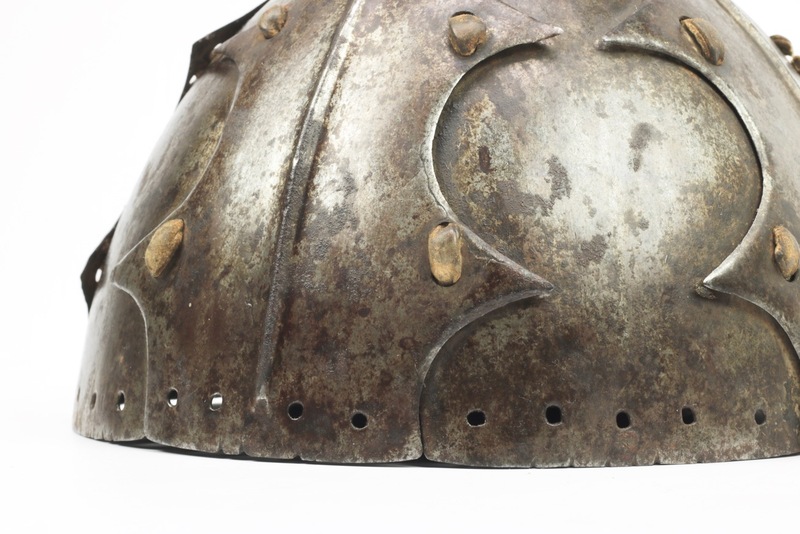 It comes with a piece of lamellar armor of the type often found to serve as neck guards for such helmets, which it probably is. 1. Melvyn C. Goldstein; The New Tibetan-English Dictionary of Modern Tibetan. Berkeley, 1984. 2. Thanks to Donald Larocca for helping considerably with the translation. 3. Donald J. Larocca; Warriors of the Himalayas; Rediscovering the Arms and Armor of Tibet. The Metropolitan Museum of Art, New York. Yale University Press, New Haven and London. Pages 51-91 exclusively deal with lamellar armor and helmets.